Top One Percent? Half a Percent? Tenth of a Percent? I have seen different statistics in terms of what is the minimum or median income, and minimum or median net-worth, in the top one percent of the United States, the top .5%, and the top .1%. Anyone have reliable statistics for this? 8.4 Billion for net worth. I think net worth is a much better measure. I used to have a link to the Census Data broken down by more than quintiles, but lost it--but this will do. 1.8 million apparently is the figure for the 95%ers, which I find surprising. This is from 2013 Consumer Finances data, so I feel pretty sure the required figures are quite a bit higher now, probably by 20-30%. I'm nowhere near either $429,000 in income, or $8.4 million net worth. But I feel rich in that I have what I need. Honestly, life is awfully good with a whole lot less than that. 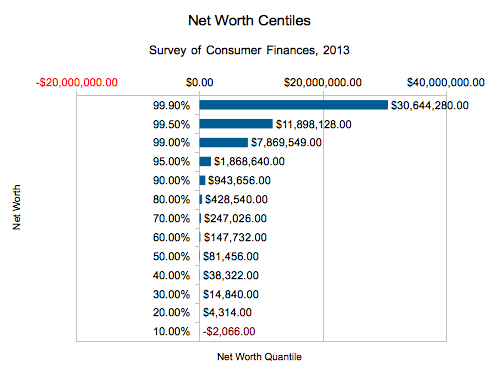 I think the most reliable data for net worth is probably the Survey of Consumer Finances. But, this requires you to rephrase the question to ask about net worth in 2013. Also, it's household net worth. What do we mean by net worth? Assets: Interest-earning assets held at financial institutions (savings accounts, money market deposit accounts, certificates of deposit, interest-earning checking accounts); other interest-earning assets (U.S. government securities, municipal or corporate bonds); stocks and mutual fund shares; rental property; mortgages held for sale of real estate; amount due from sale of business or property; non-interest earning checking accounts; U.S. savings Bonds; home ownership; vacation homes and other real estate; IRA and KEOGH accounts; 401K and Thrift Savings Plans; vehicles; and other financial assets. Liabilities: Secured liabilities (margin and broker accounts; mortgages on own home; mortgages on rental property; mortgages on other homes or real estate; debt on business or profession; and vehicle loans) and unsecured liabilities (credit card and store bills; doctor, dentist, hospital, and nursing home bills; loans from individuals; loans from financial institutions; educational loans; and other unsecured liabilities). 8.4 Million for net worth. That's an interesting article. It's written in 2012, it quoted statistics from the 2007 Survey of Consumer Finances, even though data from 2010 was available at that time. According to the article, it took $8.4 million to be in the top 1%. According to the 2013 Survey of Consumer Finances, it took $7.9 million. Should I assume that the "Gray Lady" has a follow up article that there is a reduction in income inequality? We are definitely not a typical slice of the American pie around here. Most here who are ERd are in the top 10% or even 5%. Many aspiring to join us are already at that level. We don't have that income or wealth either, but our grandchildren think we're the best, so who cares? Exactly. Comparing to others doesn't make my life better. I have more than enough. That is enough for me. The one thing charts like this do, is to realize that most people are not in the upper 5% (by definition...), yet it really doesn't take that much in NW to achieve that. Just $2M puts you in the upper 5%, at least back when the study was done. It should be easier to get to $2M, and more people in it, as time goes on. Of course, the 5% figure will rise too. Is this chart per person or per family? Now they should correlate those stats to happiness. I suspect the sweet spot for happiness would exclude the 1%. Not sure why you think that? I am very happy. Assessing someone else's happiness seems kind of difficult, no? Distinct possibility. I have seen several articles that cite research that about 60K a year is the top of the bell curve for happiness. I haven't seen similar articles in relation to total net worth, however. Being retired, my income has gone down quite a bit, but my happiness has definitely gone up! Because you have so much money to "worry" about? No, my point is that money does not buy happiness.